One of the many magical moments to be experienced within Universal Orlando’s magical Wizarding World of Harry Potter is a visit to Ollivanders Wand Shop where “the wand chooses the wizard”. The wand choosing show is a close up, intimate, and fun, interactive experience for Harry Potter fans of all ages. 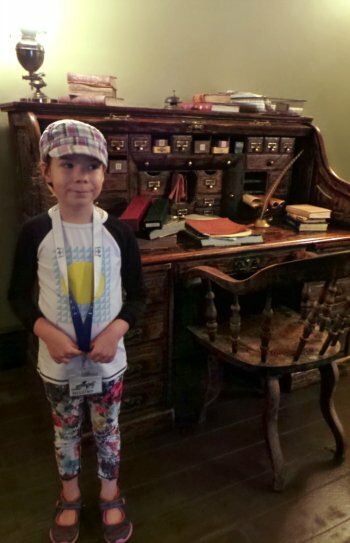 If you’re wondering how to get picked for a wand at Universal, what the interactive show is like, or if you should bring your younger children inside, read on. First things first, even if you aren’t planning on purchasing a wand, this short interactive experience is something you don’t want to miss (and if you ARE planning on purchasing a wand for yourself, or say a certain Harry Potter obsessed kiddo, you definitely want to line up at Ollivanders for your chance to be one of the lucky few who has a wand choose them). The gist of it is, you line up in (and on particularly busy days also outside of) Ollivanders, eventually entering a small room where a wand keeper picks one member of your group, calls them forward, measures them from tip to toe, and then has them try a series of wands, until the perfect wand chooses them. As the audience member who is being fitted tests out a series of wands, each spell they fire off goes wrong. The wand keeper directs them to try a particular spell, something minorly disastrous occurs, the keeper waves her wand and puts everything back to rights, and they then move on to the next wand… and so on. After a few attempts, the proper wand finds its way into the participant’s hand — there is a flash of light, a swift breeze — and the wand has chosen the wizard. You’re standing in a dimly lit room with a handful of people. 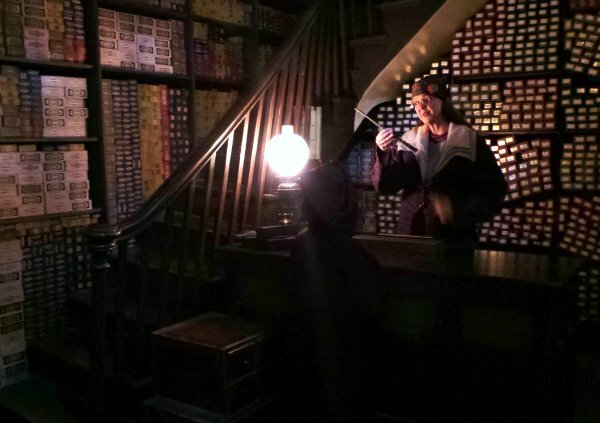 There are small wand boxes stacked into oddly angled shelves covering every inch, from floor to ceiling. The crowd oohs and ahhs, almost involuntarily, as each misfired spell goes off. The show is a joy to watch. Particularly when I’m standing there looking on as my nine year old , beaming from ear to ear, has the right wand finally choose her (they probably could have skipped the spotlight, she was glowing all on her own). First, there are two different Ollivanders storefronts where you can take part in the wand experience, the “main” store in Diagon Alley, and the branch outfit in Hogsmeade. The one located in Diagon Alley, just across the way from Madame Malkin’s robe shop, is the bigger of the two. 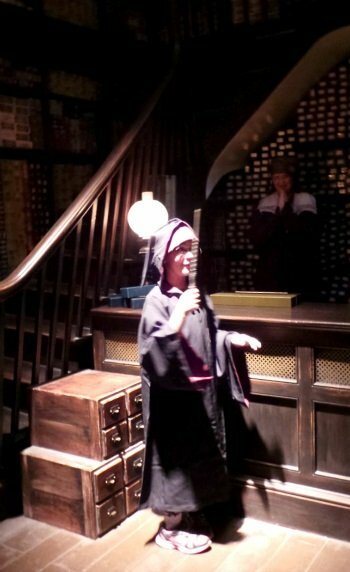 When we did the VIP tour, our guide gave us some tips on doing the wand experience. My insider info suggested that the main store in Diagon Alley is the better of the two, bigger, with shorter lineups. 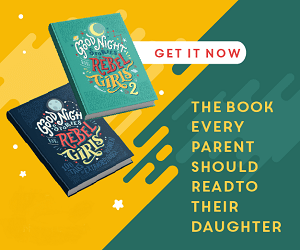 She confided that they will usually pick a child, one that is about the right age to be starting at Hogwarts (aka around 11 years old), and yes, it isn’t fair, but they often pick a boy over a girl. She also warned us that you won’t get chosen if you are already carrying a wand. 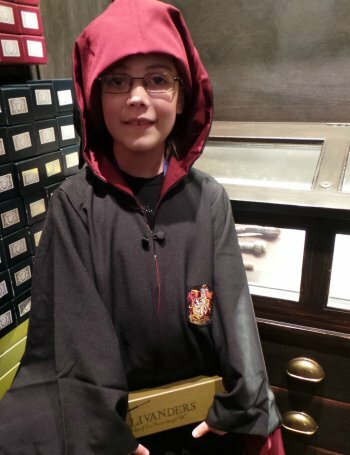 So, I hedged my bets, hid my daughter’s wand in my purse, and tucked her long hair back inside her robe, so she could pass as a boy at a quick glance. She didn’t get chosen. The wand keeper picked an older teenaged boy who didn’t seem that enchanted at having a turn in the spotlight. Warning, the show’s not scary… but it is. The show takes place in a dimly lit room. There are several special effects that take place. Infants and young children may be upset by the small bursts of light and sound. My six year old was very nervous walking into that dimly lit room, then the first spell misfire happened. The wand keeper asked the teenager to water a plant in the corner — a quick flash of lightning, a rumble of thunder, and the plant withered and died. When it rumbled and flashed lightning in that small dark room, my youngest daughter SCREAMED, a high pitched shriek that didn’t stop. As assistant quickly waved us over to the emergency exit, and within a moment I had her out into the hallway and calmed down. However, she refused to go back in (and still maintains that the whole thing was “too spooky”). Hanging out in the hallway with Little Miss Six — at least there’s this cool desk to look at. We waited a few short minutes and then the rest of the family joined us. I ended up taking my eldest daughter and getting back in line for a second go. I went back with the excuse that I had missed the majority of the show, but the truth is that I was still hoping that Grace would get chosen. The wait was short. Within five minutes we were back inside one of the wand showrooms — there are several rooms, at least three, and several shows going on simultaneously — and each room is being manned by a different wand keeper, and each room has its own special effects and magic tricks (or at least that’s how it appeared to me, as there was no lightning or thunder in this second room, maybe each room has the same tricks and they switch up which ones they use, I’m not sure). This time around our wand keeper was a kindly older woman — and this time around my very excited nine year old was chosen to have a wand choose her. As you are waiting in line, keep an eye out for a roped off area with a magicked self-sweeping broom. I’ve also been told that some of the wand boxes lining the shelves, those on the tip top shelves up out of reach, are actual props from the Potter films. My daughter walked out of that wee room clutching the Holly wand which had chosen her. And now we had the option to purchase it, or not. I had warned her ahead of time that she already had a wand, and that I wasn’t going to buy a second one — but after that magical immersive experience my normally level headed kid burst into tears at the idea of leaving her special wand behind. There are two types of Harry Potter wands available for sale at Universal — plain wands, which cost $39.95, or interactive wands, which cost $47.95. The interactive wands have a special reflective tip, and they work to cast spells within Hogsmeade (Islands of Adventure) and Diagon Alley (Universal Studios). Which is SUPER AWESOME FUN while you are at Universal, but does nothing special once you are back home. Check out this article where I detail why you want a magic wand, what fun things you can do with it within the Wizarding World, and what to do when it doesn’t work. Since we already had an interactive wand, that my daughters had been taking turns casting spells with over the past two days, I offered my tear stained girl a compromise — we would buy the cheaper, noninteractive, version of the wand which had chosen her. Just as fun to play with once we’re back home, and a few bucks cheaper. She begrudgingly agreed. However, the particular wand that chose her is only available in the interactive edition. It turns out ALL of the wands that they use during the wand choosing experience are only available in the more costly interactive versions. So, expect to shell out $47.95 to keep your special wand, if you are chosen. The Ollivanders in Diagon Alley is bigger (and quicker) than the one in Hogsmeade. Hide your wand (and maybe your hair) if you want to be chosen. The experience takes place in a dimly lit room. Young children may be frightened by the special effects. You can take video and photos. However, no flash or other light sources are allowed. It is a dimly lit room with quickly changing lighting, so getting decent photos can be challenging (and your cell phone probably won’t cut it). When you are in line, keep an eye out for neat details like the self-sweeping broom cleaning up shop. You can watch the wand choosing ceremony twice and have two different experiences, the spells in the rooms vary. Knowing now that the different rooms showcase different spells, I’d consider going through multiple times. Particularly if the line is super short, like it was last time we were there. If you want to keep the wand that has chosen you, or your child, it will cost $47.95. The wands used during the shows are only available in the more expensive interactive versions. Whether you are taking part or just watching, a visit to Ollivanders is a fun, quick, immersive experience. A truly magical “Universal Moment” that is not to be missed. They certainly had a good time in Diagon Alley (even the little one that got spooked at the wand show). This looks like it was so much fun! I would definitely do that and Great tips about the wands and the wand ceremony. My youngest might pass still. Are there scheduled times for the “Wand chooses the Wizard” show, or do they run continuously while the park is open? They run continuously. 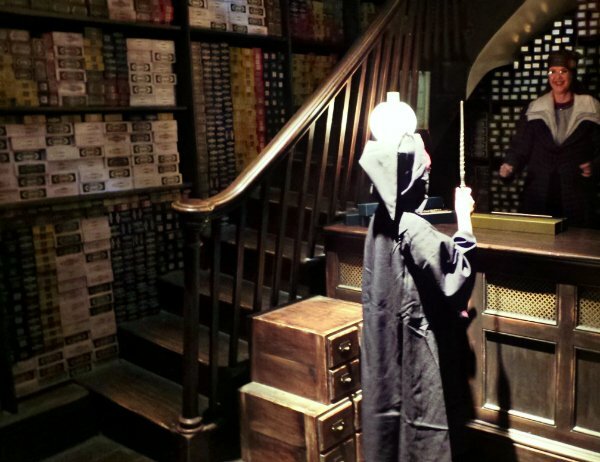 There are multiple showrooms within each wandshop, and they simultaneously have a wand choose a wizard in each room. I think they might wait for a minimum amount of people to hold a show, but since there always seems to be a lineup, I doubt that’s much of a concern. I want to say about ten people? Maybe a dozen? However I am not sure how accurate my answer is. I have done the show multiple times now, in both 2016 and 2017, but I haven’t done it very recently.